Dang. He’s not a junior anymore. I’m still paying for his licenses and tags, so I’m feeling the pain of no more junior discounts. 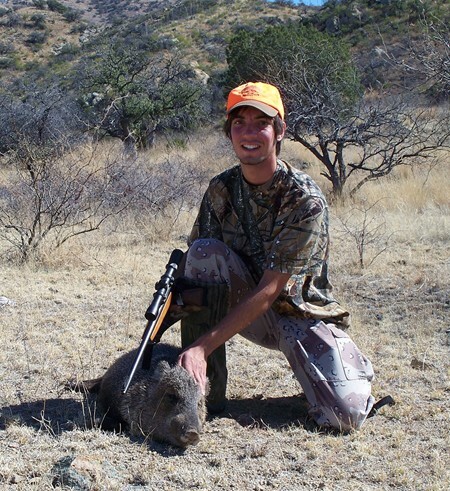 The time rolled around once again for Ben and I to head down Nogales-way for our General season javelina hunt. I’m grateful for the fact that at 18, he is still going with me to hunt piggies, as he has every year since he became eligible to hunt big game at 10. Ben doesn’t do the fall big game hunts, Sam does those with me. But so far, when I ask Ben about putting-in for spring javelina, there’s been no sign of hesitation. To me, this is notable and remarkable because this is the age when kids often pull away from parent-sponsored activities to engage in interests of their own. I’m resigned to the fact that there may be Ben-less javelina seasons sometime in the near future, but in the meantime, I’m savoring the Ben-iful ones I still have. Every time I ask whether he wants to try something different, he tells me no, he wants to hunt with his TC carbine. I must have made a great choice when I got it for him for his first pig hunt. This year at least, the pace of life allowed Ben and I to get our rifles sighted-in ahead of time, rather than having to do so at camp on opening day. The weekend before, we headed out into the desert for sighting-in and practice. We still have a few of his low-recoil loads around. We compared them this year to his max-power loads at 130 yards. Both were hitting right on at around 50 yards, but when we put the target up at the top of the ridge, the low-power rounds were hitting 4 to 5 inches low, while the high-power loads were still right-on. Well, now we know. As for myself, since acquiring the Remington M600 in 6mm Remington, there has been no other pig rifle for me. I love shooting the old iron sight military rifles, and there can be no better game to exercise them on than piggies. The problem is, that they are generally long and heavy – no fun to lug up and down steep canyon slopes. The M600 is delightfully short and light. I hardly know that it’s hanging on my shoulder. The best big game load I’ve found for the M600 so far is the 95 grain Hornady SST over 40.0 grains of IMR 4007 SSC. I sighted-in to hit one inch high at 50 yards. It was still right-on at 130. We see no reason to fire at piggies much farther than that. Well life is demanding for both of us right now, so I planned only two vacation days for this hunt, Friday and Monday. Usually that’s sufficient, because our Nogales pig spot has proven to be very reliable. We arrived in our area around 2pm on Friday, opening day, only to find that Border Patrol had turned our beautiful oak-shaded camp spot into more-or-less a permanent forward operating base. They had a couple of generators, four porta-potties, three large mobile command trailers, and numerous trucks parked there. Sheesh. Don’t get me wrong, I appreciate them stepping up their presence in the area, but did they have to take over our camp? Game and Fish even posted new signs a quarter mile up and down the road from this new base warning hunters that within those signs was an “occupied dwelling”. No shooting. Sigh. Fortunately, our pig canyon was far enough away that there was no issue. We had to resort to our alternate camp though, the one with no shade. Sigh again. So after setting up camp, we went out to Pig Canyon to see if anything would show before dark. Nothing did. We were back to the spot at first light on Saturday morning. Hunting this canyon is pretty easy, at least until we spot the pigs. We can cover the canyon very well from a couple high spots. We just sit up there as long as it takes to spot them. We know that they’re here, somewhere. That’s what gives us the confidence to just wait for them. They always show up. There’s no need to cover ground as our eyes in the binos do that most efficiently. Not long after the lights came up, I noticed a certain Y-shaped staghorn cholla. Glass revealed it not to be a cholla at all, but a doe bedded in the tall tawny grass. Don’t know how long she was watching me, but she was looking right at me. After a while, she moved a few yards and re-bedded under the branches of a mesquite. It was amazing to watch her situate herself as she bedded. She gradually disappeared right before my eyes! As the hours of the day roll by, things that you’ve looked at before, or perhaps never noticed in the first place, take on new appearances. They change shape or color with the changing angle of the sun. At about 10:30, I noticed three black dots in a row on a ridge top one-third of a mile away. When I put my binos on the three dots, it turned out to be a log on the ground with two tufts of grass in front of it, which created the effect of three dots in a row. But wait… what’s that grey dot nearby, which is MOVING? Bingo. As I watched, a total of five pigs materialized on top of the ridge. I continued watching the pigs as I waited for Ben. They seemed quite content, milling around in an open area on top of the ridge. Soon Ben joined me. From my overwatch, we had to drop 350 feet to reach the canyon bottom, then ascend 150 feet on the pig’s ridge. Our slope was rather steep, full of loose rocks that are hard to see because of the tall yellow grass. Behind me, I heard Ben go down. I looked back … “I’m alright, I’m alright.” … but he was rubbing his knee. When he caught up with me at the canyon bottom, I told him what I did to my knee a couple of years ago. We were hauling pigs out of the canyon bottom ascending that very slope. A rock rolled under my foot and my knee came down hard on top of a rock. It was months, maybe most of a year, before pain and weakness in that knee went away. I wanted to get up on top of the ridge further down, so that we could make the final stalk on the relatively flat ground along the ridge top. But now that we were below the pigs, it was obvious that the details of the topography and the brush cover wouldn’t allow that. We had to make a direct assault. About half way up the pig’s ridge, I invited Ben to lead the stalk. Just before we topped out, I told Ben to take it slow and to keep his eyes open. Wouldn’t you know, a couple steps later we saw our first pig up close. And I mean really close! It was a young one, but not a baby, cruising effortlessly under the tight catclaw bushes. We froze, and when he got to within 10 feet of us, he stopped, issued a couple of low snorts, jerking his head back a little with each grunt, but he still didn’t fully recognize the grave danger that he and his family were in. Eventually the little pig moved away from us with a couple more low snorts that weren’t strident enough to warn the others of the danger. Ben took a couple more steps up the slope to the point that he could now see on top of the ridge. Both of us had our shooting sticks with us, folded closed into walking staff mode. Ben laid his sticks down on the side of the trail. He took maybe one or two more steps up and raised his carbine. He momentarily lowered it when the pig he was tracking went behind an obstacle, but soon the gun was up again. Ben got to the top of the slope, clearing the trail for me to follow. When I got on top, there was Ben’s pig laying and kicking, but I didn’t spend much time watching it. I saw a couple of pigs slipping down the nose of the ridge through the thick catclaw – or more accurately, heard them slipping through the catclaw. I saw one pig hustling (in the wobbly way they do) up the next slope, but he was gone before I had any chance. I got up on a rock with gun in hand, waiting for a couple of minutes for any other opportunity to arise, but they were gone. That’s OK. I was just really happy to see Ben get his third pig, especially as the result of such a righteous spot-and-stalk! It turns out that Ben’s shot was only about a dozen yards, He made a perfect boiler room hit from a standing position, his first kill shot that was not propped up on the shooting sticks. I helped Ben with the red work, which went very nicely thanks to the good hit. We ended up being almost a mile away from the truck. The big canyon was in a direct line between us and the truck. We decided that our best bet was to climb to the top of the major ridge that this minor ridge was a part of, and head back to the road on this side of Pig Canyon. Still some rugged country to traverse. To lighten the load, we decided that Mr. Piggy needed to lose his head here and now. We threw him up into the crotch of a nearby oak to further drip out, and to provide an easy height to work the beheading. As we have done on previous peccary extractions, we tied him hanging from the string on the folded sticks. With a pad between the sticks and our shoulder, we took turns carrying the piggy as a hobo carries his “bindle” hanging off a pole. We arrived back at camp about one o’clock. After our late lunch, I helped Ben hang Mr. Piggy from a nearby oak, where he worked off the peccary’s sweater. We threw him in the cooler and decided to drive the 20 miles or so back to the closest civilization for some ice. We still had two more days planned for this adventure. But to tell the truth, I was already ready to call this hunt a success, even though my tag was still not wrapped around a javelina’s leg. I was pretty confident that if we just repeated our plan, that either Sunday or Monday we would get another opportunity. It’s just that I wasn’t all that anxious to gut and haul another peccary. So I announced that instead of hard-core javelina hunting on Sunday, we were going to chase after some lonely back-country geocaches instead. Oh, I would still take the rifle with me. And I instructed Ben to tie-on the .357 Taurus Tracker. As far as I’m concerned, one would be quite foolish to roam the back country around here unarmed. Our camp is only about 4 miles north of the Mexican border. Of course, there was still a chance of running into javelina. So the first thing we did on Sunday morning was head for Montaña Peak, which involved a climb of 1,250 feet to the top of one of the most prominent peaks in the area. We found the hidden geocache, a .30 caliber ammo box, and added our names to the logbook. Ben and I have stood together on numerous high peaks over the years. We got back to camp by lunch. Later in the afternoon it was a two mile hike down a rocky canyon creek bottom to a spot called Hells Gate. We came back in the dark by flashlight. We saw no pigs on either trek. Ben is heading off to NAU next year. 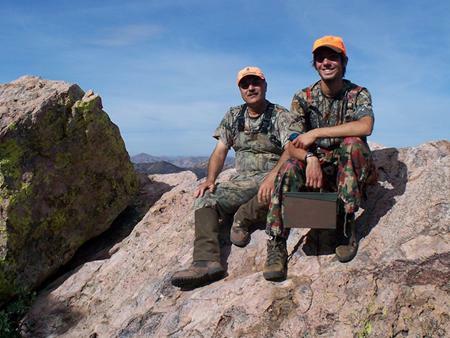 I don’t know whether his busy college schedule and the sheer distance of the travel involved – from Flagstaff to Nogales – will allow him the time to continue these father-son bonding experiences. I fervently hope so. During our last deer hunt, Sam and I discovered a spot in hunt unit 20C where the pigs are thick. Due to the changing light, Ben and I may have to give up our beloved southern Arizona Pig Canyon.